Microsoft has made a huge move on the acquisition front, snapping up LinkedIn for $26.2 billion (around £18.5 billion, or AU$35.5 billion). The deal to purchase the social network is an all-cash affair which values LinkedIn at $196 (around £140, or AU$265) per share and is inclusive of LinkedIn's net cash. The deal, which has been unanimously approved by the board of directors of both firms, should be closed out before 2016 comes to an end, subject to the usual regulatory scrutiny. 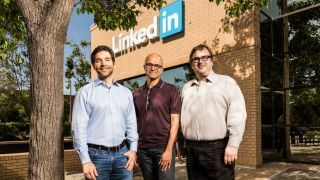 Countering potential fears of what might happen to LinkedIn after being swallowed up into the Redmond machinery, Microsoft has assured all and sundry that the social network will retain its own distinct brand, culture and independence. The message, as ever, is that nothing is going to change. Jeff Weiner is to remain chief executive of LinkedIn and will report directly to Satya Nadella. Microsoft CEO Nadella commented: "The LinkedIn team has grown a fantastic business centred on connecting the world's professionals. Together we can accelerate the growth of LinkedIn, as well as Microsoft Office 365 and Dynamics as we seek to empower every person and organisation on the planet." Weiner said: "Just as we have changed the way the world connects to opportunity, this relationship with Microsoft, and the combination of their cloud and LinkedIn's network, now gives us a chance to also change the way the world works. "For the last 13 years, we've been uniquely positioned to connect professionals to make them more productive and successful, and I'm looking forward to leading our team through the next chapter of our story." LinkedIn now has over 430 million users worldwide, having witnessed 19% growth in said membership numbers year-on-year. The number of job listings on the social network has also doubled over the past year, and there are now over 7 million active listings in total. A new mobile app has also apparently been a big success, with 60% of users now on mobile, which represents 49% growth year-on-year. Naturally, the timing of this announcement is certainly interesting, with Microsoft's reveal coming on the day of Apple's WWDC kicking off – any thunder stolen being purely coincidental, of course.